Thanks to UKBluegrass.com for the news that the 2011 Coastline Bluegrass Music Event will take place on 3-5 June at a new venue, Bryn Ffanigl Ganol Farm, Rhyd y Foel Road, Dolwen, near Llanddulas in north Wales. 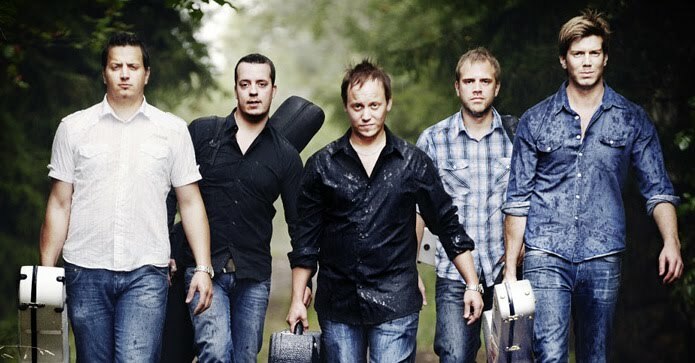 The G2 Bluegrass Band from Sweden (photo above) will top the bill as in 2008, together with two Scots bands, Longway and Home Made Jam, and the Tappalachian Clogging Team from southern England. Workshops will be given by all the above artists. Full details, including ticket prices and a downloadable booking form, are on the Event's website.